Brent, Spencer and Melinda Scheps set off for Piranha Cove, located in Grace Bay of Turks and Caicos. Marty Aaron’s been scuba diving all over the world; he’s experienced underwater blasts in the Red Sea, been chased by seals in the Galapagos and observed the sleeping sharks of Isla Mujeres, just to name a few aquatic adventures. One of his favorite diving memories takes place in the Blue Hole, a natural wonder off the coast of Belize near Turneffe Island. “I was with one of my brave daughters,” the real estate investor recalls – Haley, who is now getting her doctorate at Palo Alto University in neuropsychology, was about 13 at the time. “She didn’t like to be controlled. We would dive together as partners; she would touch everything. Porpoises, turtles, sharks. I was grabbing her arm and pulling her back. I said, ‘You have to stop this, it’s dangerous.’” He would tell her of the importance of staying close to him, too, but Haley would have none of it. Scuba diving immerses one into another world. It serves as a training ground, a bonding ground, and a context that pushes one far beyond the limits of the ordinary. It’s a humbling glimpse into the vast intricacy of nature, and it can also be an immersion in the art of the possible. 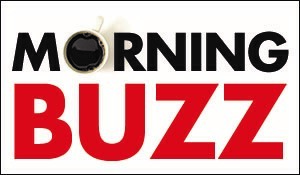 For some Buzz families, diving has served many roles over the years, but perhaps most importantly, it’s helped them to grow – as individuals, and in their relationships. 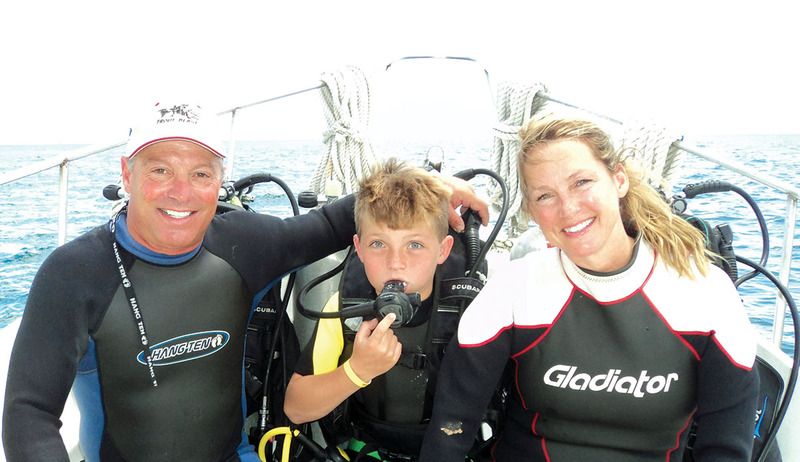 For the Scheps family, diving has been at the center of family life. Brent has been diving for about 30 years, and Melinda’s not far behind with 25 years. All of their four children are certified, and the youngest, Spencer, got his certification at the tender age of 10. “It’s such an incredible, beautiful world down there – you’ve got to go experience it,” says Melinda, a retired network engineer, waxing eloquent as she describes swimming through a school of spadefish, or cave diving with an 8-foot speckled moray eel, or watching as a school of 40 silvery barracudas swim by down below her. They wanted to share this world with their children, so they started them young at home in the pool. “We got them comfortable with the masks and the gear,” she said. They learned to breathe out of the snorkel and wear the mask without fogging it up, and how to clean it underwater. Every year they would go to Turks and Caicos, and at the resort they’d take their junior dive training, learning to use a compass, how to regulate buoyancy and all the other basics. Melinda remembers with a chuckle on one of Spencer’s first dives when, still under the influence of Nemo, he reached out to grab onto a turtle. “He thought it would be so much fun to grab the turtle and ride on it while it swam. So he grabbed the back of the turtle and thought it was the most wonderful thing in the world.” Little did he know that touching was against the rules. The divemaster threatened him that if he did it again, he would be kicked off the dive. Little Spencer learned quickly one of the cardinal rules of diving: respect. Now an eighth grader at St. Mark’s Episcopal, Spencer has 35 dives under his belt. All the other kids are grown – Cameron, 25; Kelly, 27; and Taylor, 29 – and Melinda’s grateful to have an activity that brings them all back together again. For nurse Carol and physician Eric Rothenberg, diving got more difficult when the boys came along – until they discovered Beaches, an all-inclusive resort in Turks and Caicos where the diving and daycare are included, and where the diving is close enough that Carol didn’t have to worry about leaving the boys behind. It was a great place for them to learn and to dive together as the boys got bigger. Now, says Carol, the time they spent teaching the boys to dive is paying off in first-rate diving buddies. Paul, a first-year medical student at UTMB-Galveston, and David, now a sophomore at The Emery/Weiner School, are now challenging their parents to new heights. David, who got his certification when he was 11, is heading off this summer to Sail Caribbean, which hosts a diving camp in the British Virgin Islands to get his master diver certification. Last summer, for example, they chartered a boat from the U.S. Virgin Islands and went out to dive the RMS Rhone, a U.K. Royal mail ship wrecked in 1867, where The Deep was filmed. David was “fearless,” his mother declared, and joined as his brother and father descended more than 100 feet, entered the wreck and explored it. David has been a lucky diver, his mother says; he has been face-to-face with a 13-foot dolphin and a whale shark while diving at Turks and Caicos. 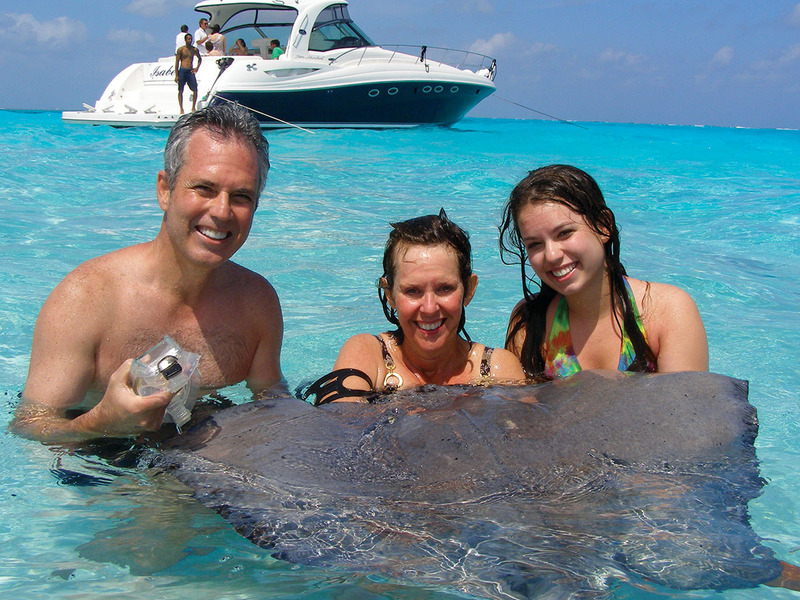 Steve, Susan and Jordan Solcher take a break from diving in the Cayman Islands to get up close and personal with a stingray. For Steve Solcher, chief financial officer at BMC Software, and wife Susan, a realtor, diving has laid a foundation for their life as a couple. Susan took a scuba-certification class at Texas A&M her first semester and loved it so much she got her advanced certification her second semester. Steve was a diver, too, and some of their first dates were dive trips to Cozumel and the Bahamas. Their children – Christian, 25, and Jordan, 23 –have grown up accompanying them on dive trips, from the Great Barrier Reef in Australia to the Cayman Islands. Other dive trips were just for them – a way to nurture their relationship. “It’s something we have a common love for; it’s a really neat activity that we look forward to,” she said. One of the most exotic trips was to a remote island off the coast of Mozambique, where they heard the low moan of whales swimming nearby as they dove. Perhaps most important to Marty, however, is the chance to fully engage yourself and your family in life – as opposed to the Facebook version. “Diving with your kids brings three aspects into your life,” said Marty. First, there’s the recognition that your time together is very valuable. Second, there’s the physical component – now you have a reason to learn to swim better. Third, there’s the thinking part – they had to get experienced in the physical, equipment side and the mental side – learning how to do the calculations, learning about pressure, air, nitrogen narcosis. The Solchers’ favorite diving getaway is in the Cayman Islands, and the diving company they use is Cayman Diving School, rated five stars on Trip Advisor, Caymandiving.com. Susan recommends the company for beginners, as well. They always stay at the Ritz Carlton in Cayman Islands, and their favorite places to eat are: Sunshine Grill, Calypso Grill, Grand Old House, Luca, Ristorante Pappagallo, and Lobster Pot. The restaurant at the Ritz – Seven – is also good but pricey, and they like to venture out and try the local places. The Scheps are also big fans of Beaches Turks and Caicos Resort. The resort offers activities to captivate kids from 3 up, says Melinda; the young ones get to bake cookies with the Cookie Monster while the older ones enjoy fire pits and live reggae bands at sunset. Free mini spa treatment is included for the entire family. For the Scheps, the two best places to get certified in Houston are Dive Tech off I-10 at TC Jester (www.divetechhouston.com) or Gigglin’ Marlin. Both dive shops have deep swimming pool tanks on premise for your scuba training. Favorite dive sites include Grace Bay, Pine Cay, North West Point, West Caicos & French Cay. These sites feature giant sea turtles, eagle rays, sharks, barracudas, African pompano, dolphins, and even migrating humpback whales in the spring, as French Cay is on their migration path.